A screenshot of the CCTV footage showing the suspects committing the crime. 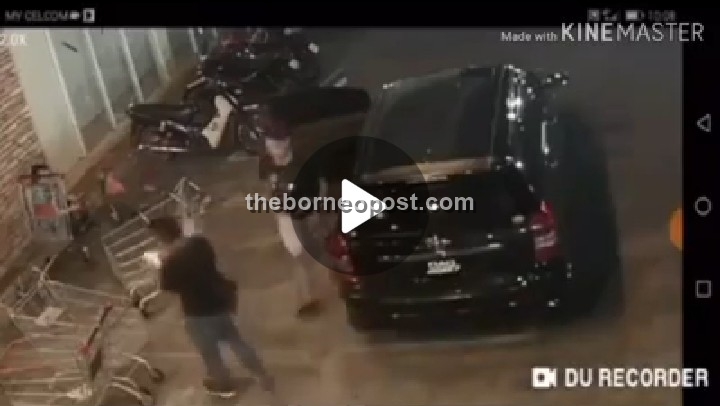 KUCHING: One of the two suspects who were involved in a robbery at the car park of a shopping mall in Batu Kawa has been arrested by the police at Jalan Temple at around 9.30pm last night. According to Padawan District deputy chief DSP Merbin Lisa, the suspect, a 39-year-old man, admitted that he was involved in the incident together with another suspect who is still at large. “Further investigations also revealed that the suspect we arrested has nine previous cases of crime and drug abuse,” said Merbin in a statement today. Also seized by the police was the multi-purpose vehicle that was used by the suspects to flee the scene. “We urge those with information on the whereabouts of the second suspect to contact the police immediately,” he added. The case is being investigated under Section 394 of the Penal Code for robbery. Meanwhile, the incident which was recorded by the mall’s CCTV cameras also went viral on social media, with many condemning the robbery. Based on the CCTV’s timestamp, the incident took place at around 9.45pm on Feb 20 on the mall’s rooftop car park. In the video, both suspects were seemingly waiting by their vehicle when they spotted the victim, who was waiting for her husband. One of the suspects then approached the woman while showing her a piece of white paper before grabbing her handphone, resulting in a struggle. In the scuffle, the victim’s phone was snatched away from her when one of the other suspects, who was scouting the area for potential witnesses, came to the aid of his accomplice.